Blanch 3 tomatoes, remove the skin and blend it to a puree. Keep it aside. Chop carrots into medium sized pieces and onions finely. Slice capsicum thinly. Cook red lentils until soft. Mash it well and keep it aside. You can also pressure cook lentils. Heat oil in a pan, add finely chopped garlic and onions. Saute until onions turn transparent. Add chopped tomatoes, chilli powder and salt needed. Cook until tomato softens. Add tomato puree and thinly sliced capsicum. Cook until the mixture thickens stirring from time to time. Add cooked red lentils/masoor dal, 3/4 cup of water and cook on low heat, stirring in between for 5-6 minutes. Garnish with finely chopped coriander leaves. Now our lentil stew is ready. We will cook the polenta. Polenta will be ready in a jiffy as I have used the quick cooking polenta. Bring 2 cups of water to boil. Add salt needed. As we will be adding cheese, add less salt. 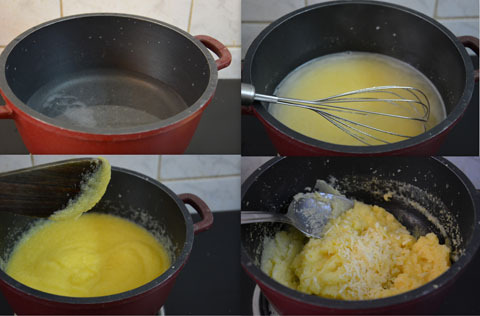 Reduce the heat to low and stir in polenta gradually with one hand and stir continuously with a whisk with the other hand. This is done to prevent lumps. Continue to stir. When it starts thickening, turn off the heat and add grated cheeses or a blob of butter or both. Mix well until smooth. Polenta is ready now. Polenta will thicken as it cools. If you want a smooth consistency, you may add a little warm water to loosen it. 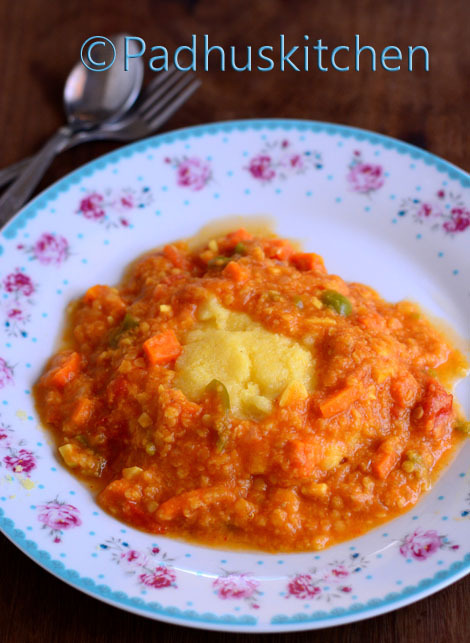 Serve hot polenta topped with piping hot lentil stew. Enjoy!! seems delicious and easy too :) thanks for the step by step tutorial.